The 12th annual Feast of the Fairways Charity Classic turned into an electrifying experience for fans of Jaguar and Land Rover vehicles. 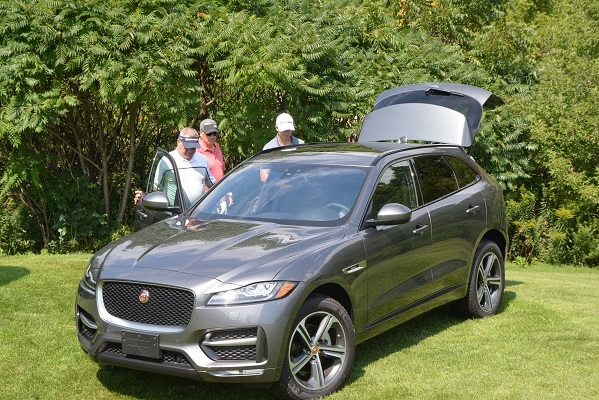 On August 24, the two major sponsors of Budds’ Jaguar Land Rover Feast of the Fairways Charity Classic increased the voltage of the annual charity tournament by showcasing both brands first electric vehicles – and that created quite a buzz. “Another perfect day at Glen Abbey to raise funds to fight cancer and share the next generation of Jaguar and Land Rover vehicles with friends and colleagues who all believe in and support the battle against cancer,” says Terry Budd, owner of Budds’ Imported Cars in Oakville. On display on the golf course was the eye-catching 2019 Jaguar I-Pace – Jaguar’s first fully electric vehicle and the plug-in hybrid Range Rover 2019 PHEV, along with several other models from each brand. “Jaguar is the first luxury brand with a fully electric vehicle and they’ll be available in Canada starting in September. Interest is so high, we’re actually sold out for 2019,” Budd said, noting the Range Rover PHEV models including a sleek sport edition should be available before the end of the year. On hole No. 3 golfers teed it up with sushi from Mye Japanese Restaurant, on No. 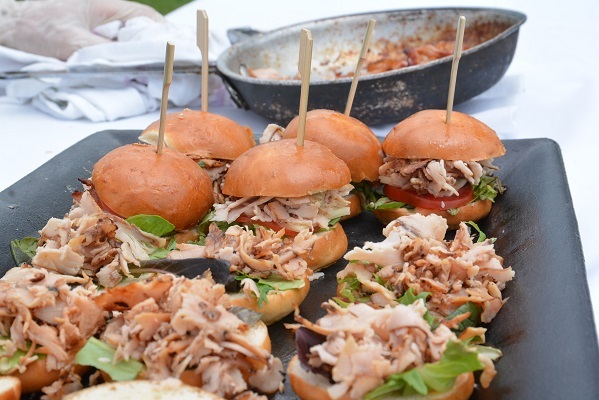 7 they were treated to turkey sliders on a bun from Brü Restaurant, on No. 11 Jonathans Restaurant barbecued striploin beef sliders and homemade BBQ chips, on No. 13 The Mermaid and the Oyster served up 500-plus fresh oysters – and on No. 17, Eighteen Restaurant at Glen Abbey prepared decadent grilled cheese sandwiches. “I didn’t think you could make last year’s burgers any better, but you did. That pepperoni sauce is bang on,” Jim Poutsoungas said, as he enjoyed the view on No. 11 with Jonathans' Executive Chef Michael Spudowski and owner Jason Alikakos who greet the guests personally each year. “I’m going to have to start putting that pepperoni sauce in the (golf) bag. Look how far the ball goes after you have one of those burgers,” added Daniel Poutsoungas, as the real charcoal smell and smoke from the BBQ wafted across the tee deck. 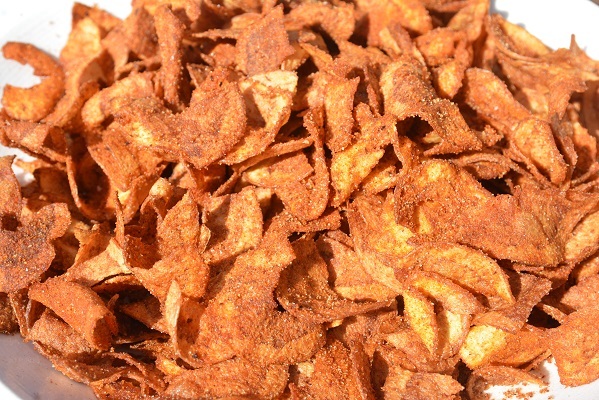 Golfers also experienced the spiciest homemade potato chips you can imagine – they have you sweating on the tee deck even before you need to hit one of the most memorable shots in golf. Unbelievably, a handful of groups even took an extra bag or two with them for the rest of the round! Chef Michael personally makes them once a year for this event and they’re not on the menu at Jonathans. After the round, golfers and their spouses gathered on the clubhouse deck overlooking No. 18 for silent and live auctions, dancing to live music and the five-course feast prepared by Glen Abbey Executive Chef, Kevin Watson that included: succulent seared Nova Scotia scallops with celery root puree, cucumber slaw, lemon zest, radish shoots and chili oil on cedar board; organic chicken liver pate brulee with herb crostini; miso-marinated chilean sea bass with fennel and mango salad; Collingwood’s farm artisan AAA beef tenderloin with expresso rub, fresh herb rosti, butter rapini and balsamic wild cherry glaze as the main; followed by grilled peach panna cotta with tuxedo strawberries for dessert. 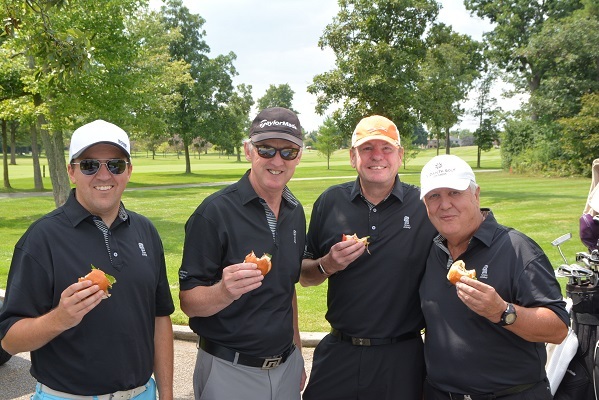 The team of Peter Wrong, Steve Gallace, Craig Alvaro and Mike Savage took top spot with a score of 11-under par, followed by the team of Steve Nicholson, Tsvet Tsokov and Gord Robb at 7-under, with Allen Baker, Bryon Loeppky, Taylor Irving and Jean Martin in third at 5-under. “We’ll be back next year to support the Budd Family in this charity fundraiser. I’m living proof that cancer can be beaten, but it really is a battle of life or death for many people – whatever we can do to help assist the Canadian Cancer Society in this fight is very important,” added Gord who has played in all of the events. This year’s event raised nearly $35,000 bringing the 12-year total to approximately $300,000 that goes to the Oakville Branch of the Canadian Cancer Society. The Budd family started the event to remember Terry’s father, Stuart, the co-founder of Budd Automotive Group, after he died from cancer. Terry points out that several sponsors including; the five on-course restaurants, Scotiabank and Jaguar Land Rover Canada have been with the tournament since its inception as have about 30 to 40 of the golfers, and there are always newcomers to the party. Cancer affects everyone. 1 in 2 Canadians will be diagnosed with cancer in their lifetime. Today, 268 people receiving treatment far from home woke up in a Canadian Cancer Society lodge – a warm and comforting home away from home that allows patients to focus on getting better rather than worrying about traveling long distances for treatment. Every day, more than 34,200 people reach out to the Canadian Cancer Society for trusted information and caring support about cancer – and they receive it, by phone or online, 24/7. On an average day, 2,600 Canadian Cancer Society volunteers share their passion and compassion, transforming lives in the process.